If you are interested in a more advanced datagrid based on jQuery, we are working on jQueryGrid, make sure to subscribe to the mailing list. 23/08/2012 Sorting and Pagination bug fixes. tQuery now support filtering. 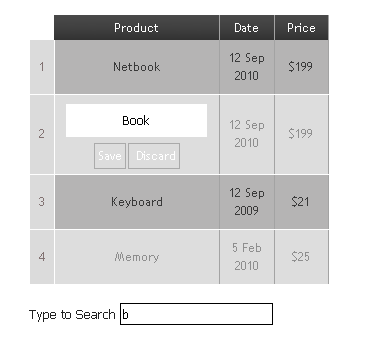 You can add a search box to your tQuery tables. The search feature give exact and instantaneous results. There are many reasons why you should pick tQuery. First is the consistency and precision in filtering and sorting. 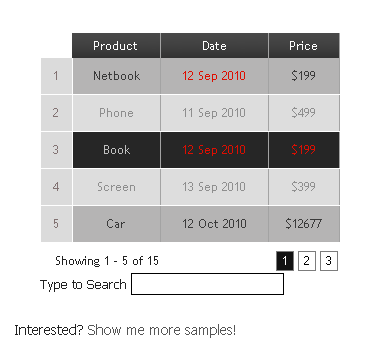 Secondly, tQuery theme is completely customizable; you can change the whole feel and look of your tables. Finally, it’s easy to implement; no-coding experience is required. Row and Column Highlighting: Just hover over any row or column to highlight it. You can change the highlight effect by coding your own style. Click to Highlight: Click a cell to automatically highlight any other cell with the same content. 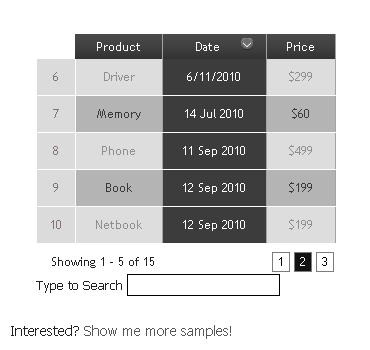 Custom Sorting: Specify which kind of data you are sorting. You can sort alphanumeric, numeric and date formats. Multiple samples: Quickly learn the usage and main features of tQuery with our associated samples.